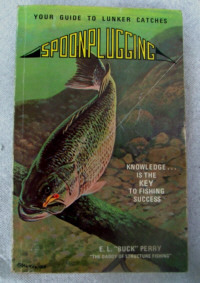 Buck Perry is known as the 'Daddy of structure fishing' by many top U.S. anglers, many of whom attribute much of their success to the start this book gave them. It is about locating fish and presenting lures to them, which is all you really need to know to be a successful angler. It is not about actions and colours, in fact it is quite scathing about the importance of such matters, it concentrates on getting to know the underwater features of a water and how the fish will relate to them. Mainly written about largemouth bass in large lakes, boat fishing of course, and mostly trolling, the information applies to all predatory fish to some extent, and seems to fit well to pike. It was first written in 1965, with subsequent revisions up to 1973, so some of the tackle described is now obsolete, braided Spectra line was unheard of then and sonar technology has come on rather since then as well. It is not an easy read - it has too much hype, and it is not really for the beginner, but a beginner would not stay a beginner for long if he took to heart the key elements of this book. I admit though that it took me some time to understand how to apply the thinking to my local rivers, but it was worth the effort, my catches have improved significantly - especially on what were once tough days - as a result of reading and interpreting this book. No other book has had that effect before. Do I recommend it? Only if you are prepared to work really hard at your predator fishing (a good bait angler will also learn plenty from this). If your idea of working hard at your lure fishing is trying another colour then it's not for you, there are no magic lures either, but dramatically improved catches await if you are determined enough. Don't blame me if you hate it. Five years on from writing the above review I still think it's easily the most important thing I've ever read about fish location. I also still think it's a lousy read and difficult to apply immediately to many UK situations but when you finally "get" it then everything else fits in very nicely. One particular thing in the book that I would pick out to criticise is the assertion about lure size not mattering much, that is very wrong.